Jaguar club of Tulsa board members. 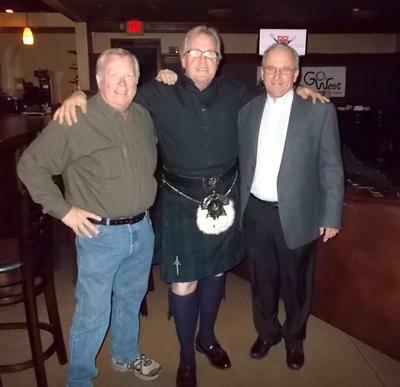 This is a photo of me in my new Black Watch tartan kilt in the bar at a Jag club dinner. It was fun, and interestingly enough I didn't get one comment from anyone at the restaurant, even thought it was a country western restaurant / bar. This event was the Jaguar club of Tulsa instillation dinner, and as it's organizer I was going to arrive about a 1/2 hour early. While I was at home preparing to go to a CW bar in a kilt, I was thinking WTF's wrong with me? I'm going to wear a kilt to a CW place? Geeeezzzzz...LOL..LOL..Then I just said, SCREW that, I don't have any anxiety about this deal that a shot of tequila can't solve, and you know what? sure enough, that two fingers of tequila about an hour before departure was the cure. As my self prescribed elixir began to kick in, my prospective on the whole deal began to change too. Needless to say, all went great. It was my goal to add a bit of fun to the club function (I think that did), have a great time (I did) and see just how much of a kilt guy I really am, and I did that too. So, as I continue to wear one of my kilts to different locations and events, I must say that the anxiety (any anxiety) about kilt wearing is really starting to wear off. I'm also finding out that a kilt seems to be accepted in all the places that I've gone, and while I haven't received many "side ways" glances, I HAVE experienced a lot of (I'll just say) alluring and admiring looks, along with several nice comments about my kilt, and about "being kilted". In an effort to desensitize myself about kilt wearing (something that I shouldn't be anxious about any way), I've decided to make all Fridays kilt day. It will be interesting to see how long that lasts...LOL.. So, I just thought that I'd give you something to look at, and have fun with. Have a great day, and (something that I never seem to remember) have some fun today!! Great Story. My comments from the U.K. are that one is unlikely to see another Kiltie whilst you are wearing the Kilt. I only have embarrassing questions one or twice a year.